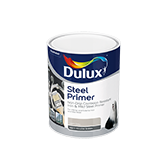 Dulux Primer for Steel is a versatile corrosion resistant primer for use on new or lightly rusted iron and steel. High quality general-purpose corrosion resistant metal primer. Suitable for new or hand cleaned rusty surfaces.